The transducer changes the physical quantity into an electrical signal. It is an electronic device which has two main functions, i.e., sensing and transduction. It senses the physical quantity and then converts it into mechanical works or electrical signals. 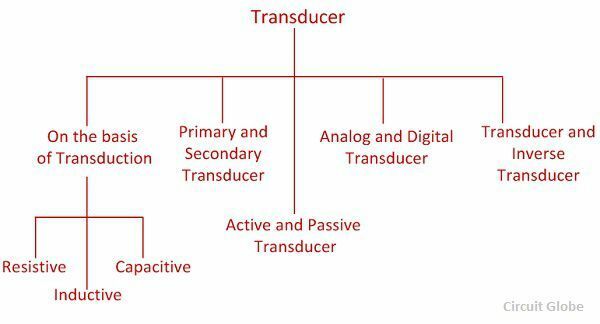 The transducer is of many types, and they can be classified by the following criteria. The transducer receives the measurand and gives a proportional amount of output signal. The output signal is sent to the conditioning device where the signal is attenuated, filtered, and modulated. The input quantity is the non-electrical quantity, and the output electrical signal is in the form of the current, voltage or frequency. The transducer is classified by the transduction medium. The transduction medium may be resistive, inductive or capacitive depends on the conversion process that how input transducer converts the input signal into resistance, inductance and capacitance respectively. Primary Transducer – The transducer consists the mechanical as well as the electrical devices. The mechanical devices of the transducer change the physical input quantities into a mechanical signal. This mechanical device is known as the primary transducers. Secondary Transducer – The secondary transducer converts the mechanical signal into an electrical signal. The magnitude of the output signal depends on the input mechanical signal. 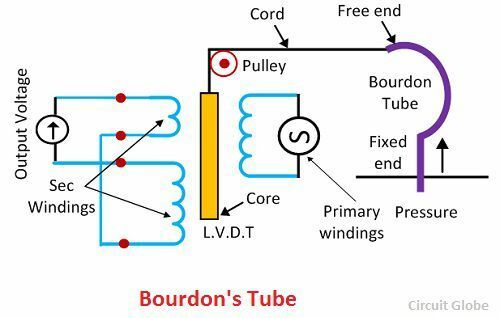 Consider the Bourdon’s Tube shown in the figure below. The tube act as a primary transducer. It detects the pressure and converts it into a displacement from its free end. The displacement of the free ends moves the core of the linear variable displacement transformer. The movement of the core induces the output voltage which is directly proportional to the displacement of the tube free end. Thus, the two type of transduction occurs in the Bourdon’s tube. First, the pressure is converted into a displacement and then it is converted into the voltage by the help of the L.V.D.T. The Bourdon’s Tube is the primary transducer, and the L.V.D.T is called the secondary transducer. The transducer is classified as the active and passive transducer. Passive Transducer – The transducer which requires the power from an external supply source is known as the passive transducer. They are also known as the external power transducer. The capacitive, resistive and inductive transducers are the example of the passive transducer. Active Transducer – The transducer which does not require the external power source is known as the active transducer. Such type of transducer develops theirs owns voltage or current, hence known as a self-generating transducer. The output signal is obtained from the physical input quantity. The physical quantity like velocity, temperature, force and the intensity of light is induced with the help of the transducer. The piezoelectric crystal, photo-voltaic cell, tacho generator, thermocouples, photovoltaic cell are the examples of the active transducers. Examples – Consider the examples of a piezoelectric crystal. The crystal is sandwiched between the two metallic electrodes, and the entire sandwiched is fastened to the base. The mass is placed on the top of the sandwiched. The piezo crystal has the special property because of which when the force is applied to the crystal, they induce the voltage. The base provides the acceleration due to which the voltage is generated. 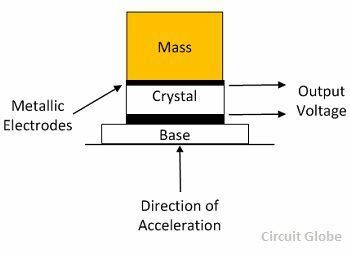 The mass applies on the crystals induces an output voltage. The output voltage is proportional to the acceleration. The above mention transducer is known as the accelerometer which converts the acceleration into an electric voltage. This transducer does not require any auxiliary power source for the conversion of physical quantity into an electrical signal. The transducer can also be classified by their output signals. The output signal of the transducer may be continuous or discrete. Analog Transducer – The Analog transducer changes the input quantity into a continuous function. The strain gauge, L.V.D.T, thermocouple, thermistor are the examples of the analogue transducer. Digital Transducer – These transducers convert an input quantity into a digital signal or in the form of the pulse. The digital signals work on high or low power. Transducer – The device which converts the non-electrical quantity into an electric quantity is known as the transducer. Inverse Transducer – The transducer which converts the electric quantity into a physical quantity, such type of transducers is known as the inverse transducer. The transducer has high electrical input and low non-electrical output.